Horses scared of driving vehicles. It is pretty much accepted that horses are scared of driving vehicles. Most of the riders who come past Obama are kicking and whipping their animals to get past, which really upsets Obama who hates whips, and upsets the riders, who hate me pointing out that my pony hates whips. So why are horses scared of driving vehicles? Or more to the point, are horses scared of driving vehicles? A couple of days ago I took the iBex up to Belstone to play, and see if I could drive up Belstone Tor in a wheelchair, as you do. Life got complicated the minute we entered Belstone Common as we were promptly mugged by three very small handbags. These ponies are the marginally more valuable ponies as apparently they are favoured on the continent for designer pony skin handbags. I can’t decide wheether this is more unpleasant than the other market, stuffing them as designer rocking horses. But as you can see, regardless of their eventual fate, they are not scared of the iBex, demonstrably, a horse drawn vehicle. 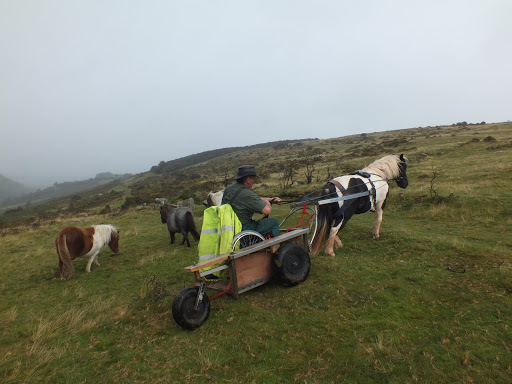 Since this was my first time on this bit of Dartmoor, they had never seen me or the vehicle before, and when this photo was taken, we had only just got throught the gate above the water treatment plant. 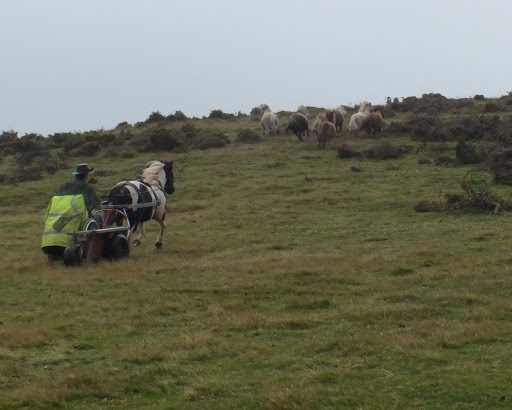 We carried on for half a mile or so, with an attentive audience until we headed for the Tor, when the handbags left us, not noticeably terrified, but then nobody was kicking them, hitting them or jabbing them in the mouth with a bit. 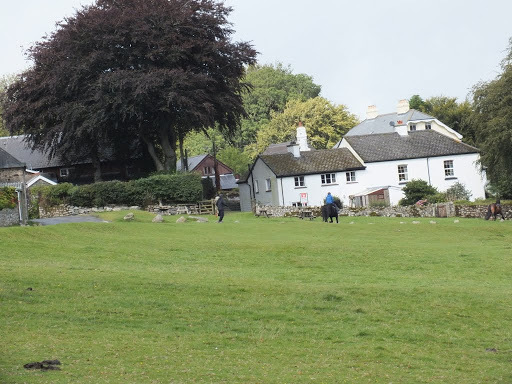 After stooging around having fun and deciding against the route up the Tor on the grounds of dodgy visibility, driving drizzle, and Obama’s near permanent determination to go back and play with his new found friends, we headed back for the gate to the Common. Where we found a new bunch of ponies to play with and Obama set off at speed. 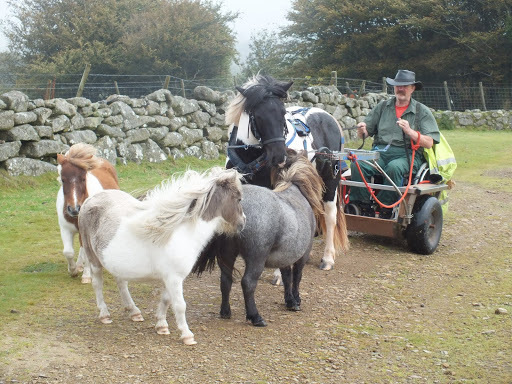 But they didn’t stay scared, the minute I decided that we were going maybe a touch fast, for unknown ground, from a wheelchair, chasing wild ponies etc Obama and I set off for the gate. 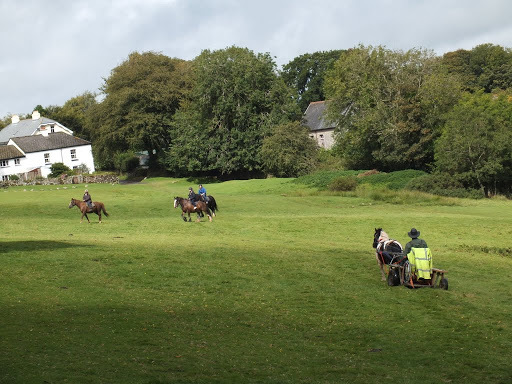 With the ponies following on……. So we head off through the gate, down through Belstone to see the river by the sheepfold, and come back across the green where we meet three riders. Obama was trotting enthusiastically towards them when the leader screamed that she had two complete novices riding. So I pulled Obama up, bitless, no problem, and stood while they headed up to the road with the leader shouting “put the leg on”. I was rather expecting to hear the beginners shouting back that their legs hadn’t actually come off, but next moment, one rider had come off and you can see the horse legging it home on the right, the other beginner being carted home in the middle, and the one whose legs torso and head had all come off, running behind. The leader is out of frame on the left. 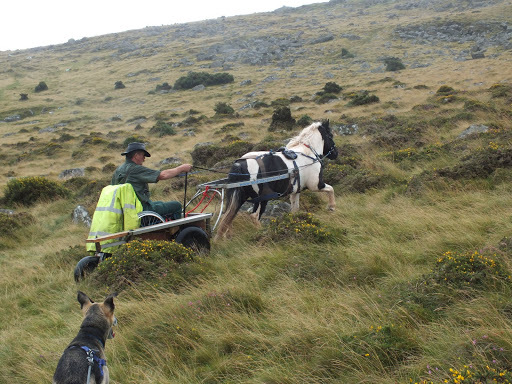 So wild ponies have no problems with driving vehicles, even when they have just been galloped at them, while riding school animals are so terrified they flee. I wouldn’t say they were naturally scared of horse drawn vehicles. I would say they had been taught to fear them. Why, and How, are complex subjects and I will come back to them. So before you next say your horse or pony is scared of a horse drawn vehicle, or anything it hasn’t seen before, ask yourself, why it is scared, and whose fault is it. 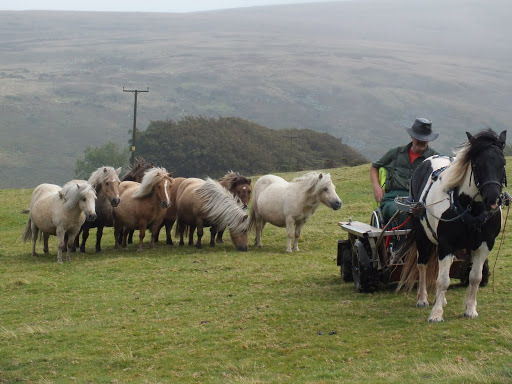 The ponies that weren’t scared hadn’t been trained, and hadn’t got people sitting on them, banging them in the mouth, hitting them with sticks or performing reconstructive surgery and putting their legs on. 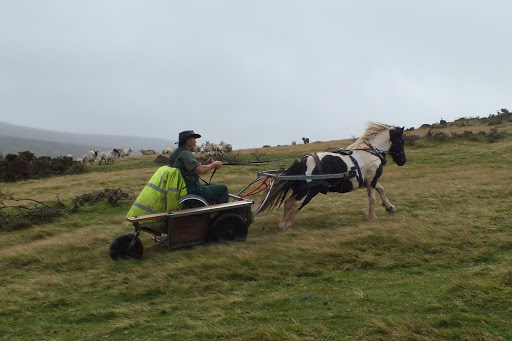 I had fun, wheelchairs across dartmoor are pure fun with the iBex, and Obama in a hooligan mood.